George Eogan is an Irish Archaeologist with particular interest in the Neolithic and Late Bronze Ages. A first degree at University College Dublin was followed by a doctoral thesis on Irish Late Bronze Age swords at Trinity College Dublin under Frank Mitchell. In the 1950's he worked with P.J. Hartnett on the Neolithic passage tomb at Fourknocks, and with Sean O Riordain at the Mound of the Hostages on the Hill of Tara. 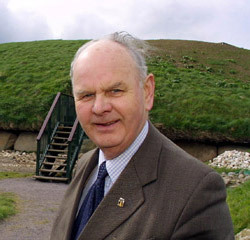 He was the Director of the Knowth Research Project and excavated at Knowth for more than 40 years as part of his investigation of the Passage Tomb builders in Ireland and Western Europe. Professor Eogan is a native of Nobber, Co. Meath in Ireland and has taught and lectured extensively on Irish archaeology. You’ve been working at the site, on and off, for 50 years now. Is it slow, deliberate work or have there been any dramatic Tutankhamun-esque breakthroughs? 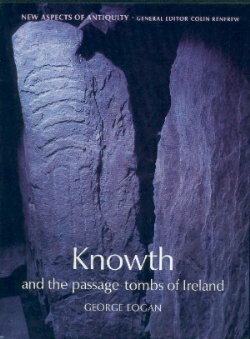 Knowth and the passage-tombs of Ireland by George Eogan.